Why is Tesla struggling to build the Model 3? Why is Tesla struggling with the Model 3? 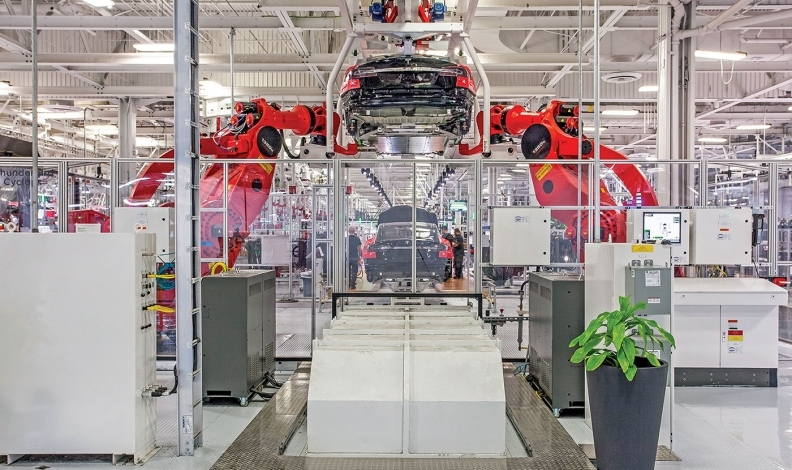 Tesla Model S cars, which experts say require less welding than the Model 3s, are assembled in Fremont. After the Journal report, Musk tweeted a of the Model 3 production line, which was operating at one-tenth of its potential speed. In the video, sparks fly as two robotic arms assemble parts of the vehicle frame. He followed with another on Wednesday, Oct. 11, showing body panel stamping at full speed. "Resistance welding should make a little smoke, but when you see stuff popping out like that, that's called expulsion," automotive manufacturing consultant Michael Tracy of Agile Group in Howell, Michigan, said of the first video. "It's symptomatic of weld spots getting too hot because they're poorly planned, or in this case, the metal not being pulled all the way together." Detroit also has been turning its attention to electrification. Ford Motor plans to introduce 13 electrified vehicles in the next five years, including a crossover with 300 miles of range. General Motors introduced the Chevrolet Bolt last year, with at least 20 all-electric or hydrogen fuel cell vehicles coming by 2023 — two such vehicles will be introduced in the next 18 months.